4x LAN ! 3x RS232 ! The FleetPC-8 Car-PC series offers high performance and maximum connectivity. 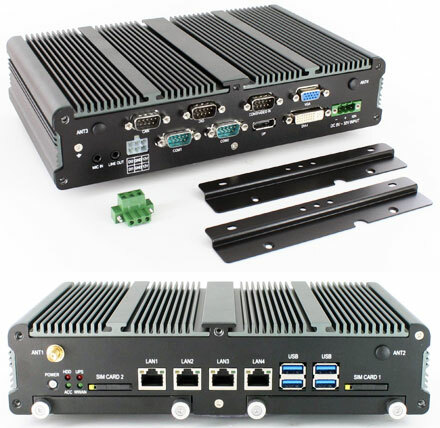 The 4x LAN ports and dual hot-swappable 2.5" drive bays (RAID 0/1 support) and internal SATA DOM module connector, the system is for example perfect for digital IP video recording applications (police, etc.). The FleetPC-8-VID model in addition is equipped with a four-channel analog video card. 3x Mini-PCIe slots allow maximum expandability options including LTE, UMTS, 3G, 3.5G, GSM/GPRS, WLAN and Bluetooth. Two SIM card slots enable redundant mobile connectivity with only one single modem card. The internal ublox6 GPS module enables fast and accurate positioning. The PC is completely fanless and is equipped with an Intel Core i7-3517UE 2x1.7Ghz CPU and 2GB RAM (upgradeable up to 8GB). For FleetPC-8 we offer an direct connector cable for our TFT-dispays.